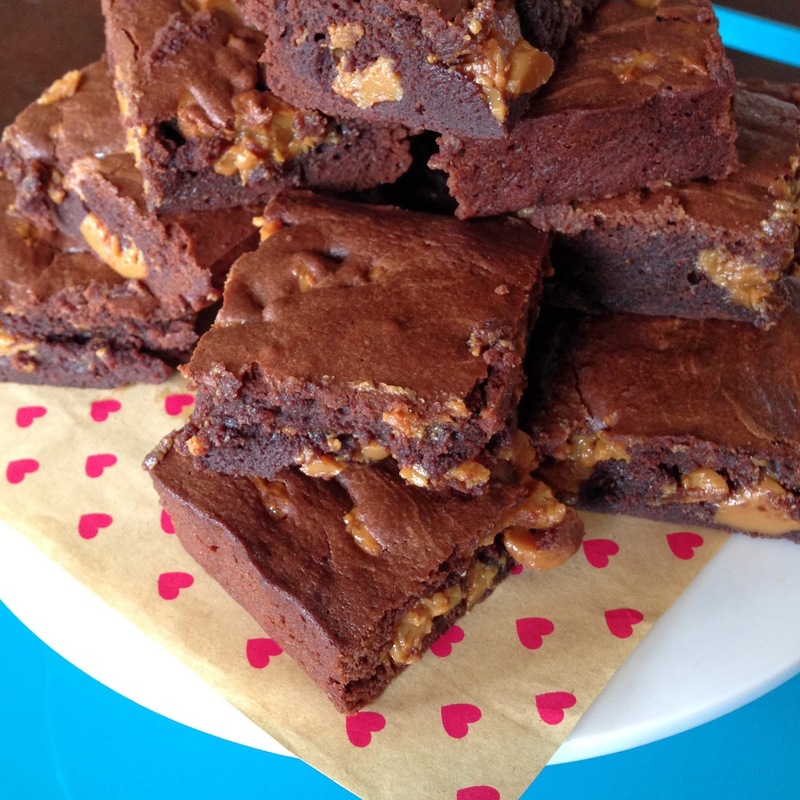 Stella+Olive: Dulce de Leche Chocolate brownies . . . . . . . what to give your neighbours when they won't accept gifts! 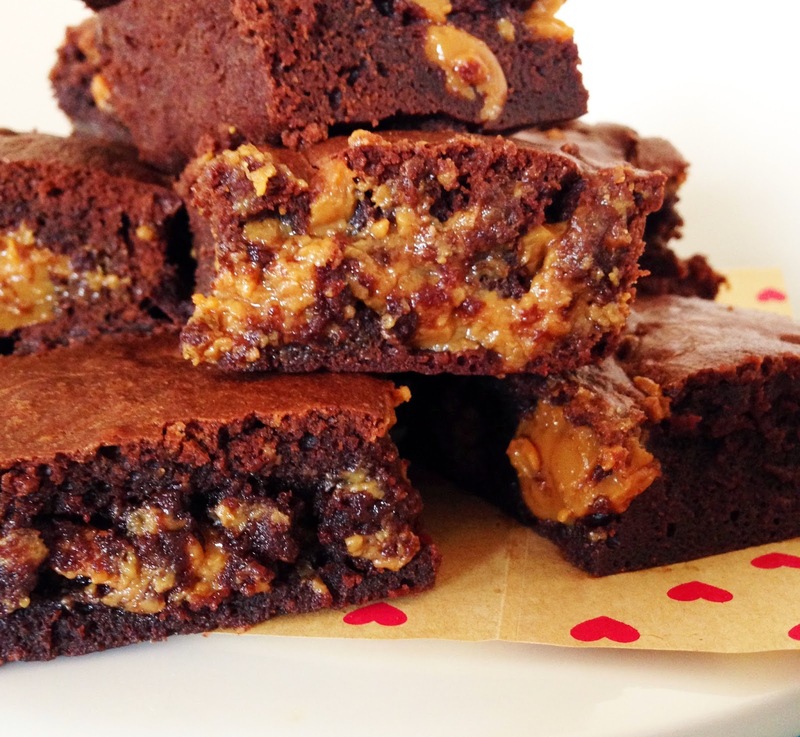 Dulce de Leche Chocolate brownies . . . . . . . what to give your neighbours when they won't accept gifts! I have been blessed with either my Dad or brother mowing the lawn, have had no lawn, lawn maintenance included in rent or neighbours that have mowed the lawn. I have lived where I currently live for nearly a year and the neighbour has mowed our front lawn once a fortnight (or a week in summer) without being asked and then for a while also mowed our back lawn. Myself and my flatmate greatly appreciate his efforts and tried to thank him with beer (which he refused to take) so now we are going the baked good route. I don't know my neighbour and his family's food tastes all that well, so thought that something chocolate always goes down well. 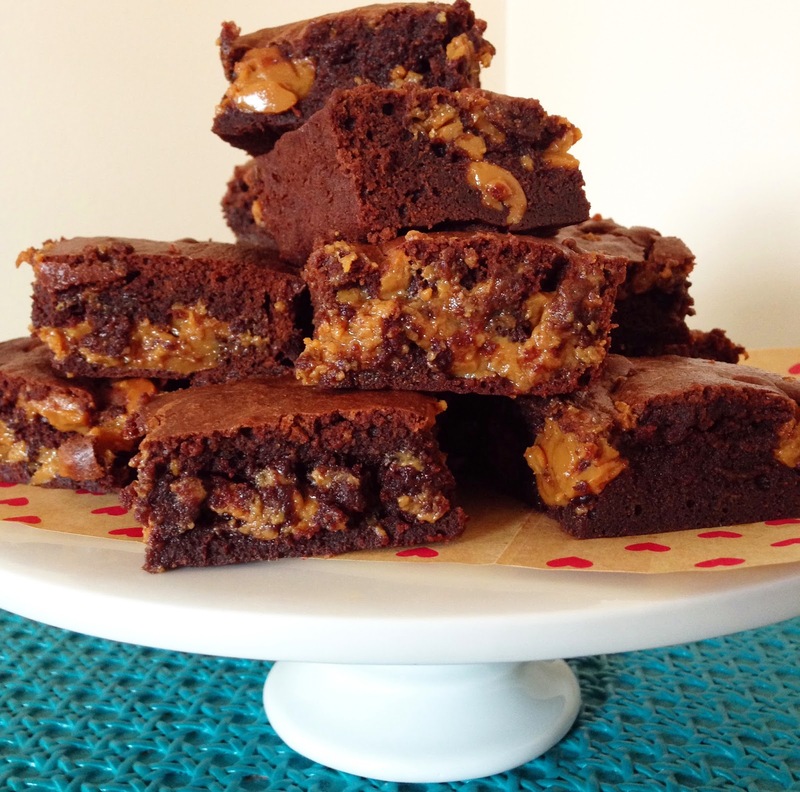 I have made these Dulce de Leche Chocolate brownies many times and they never disappoint. 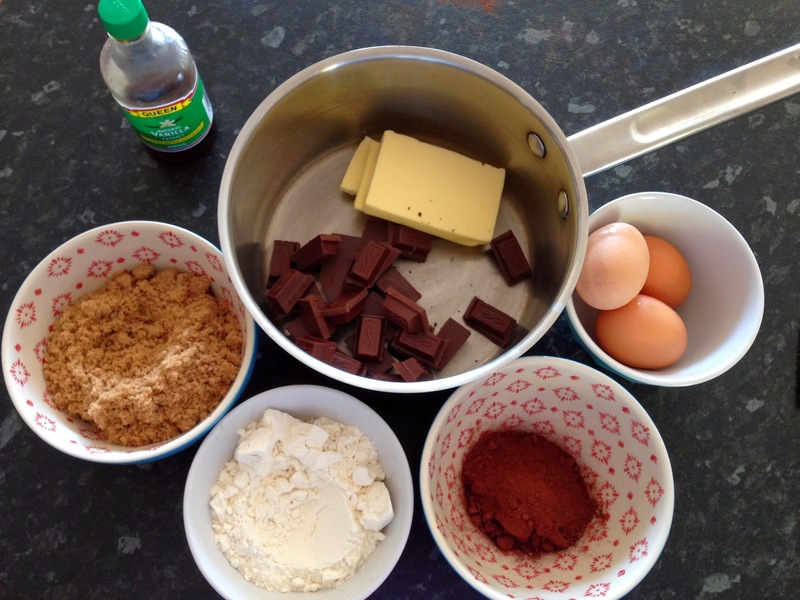 They are also very simple to make and only use own bowl to mix up and cook in 30 minutes (not counting if you cook your own caramel. So, if you need to say thank you to someone but they won't accept gifts, try this on for size. 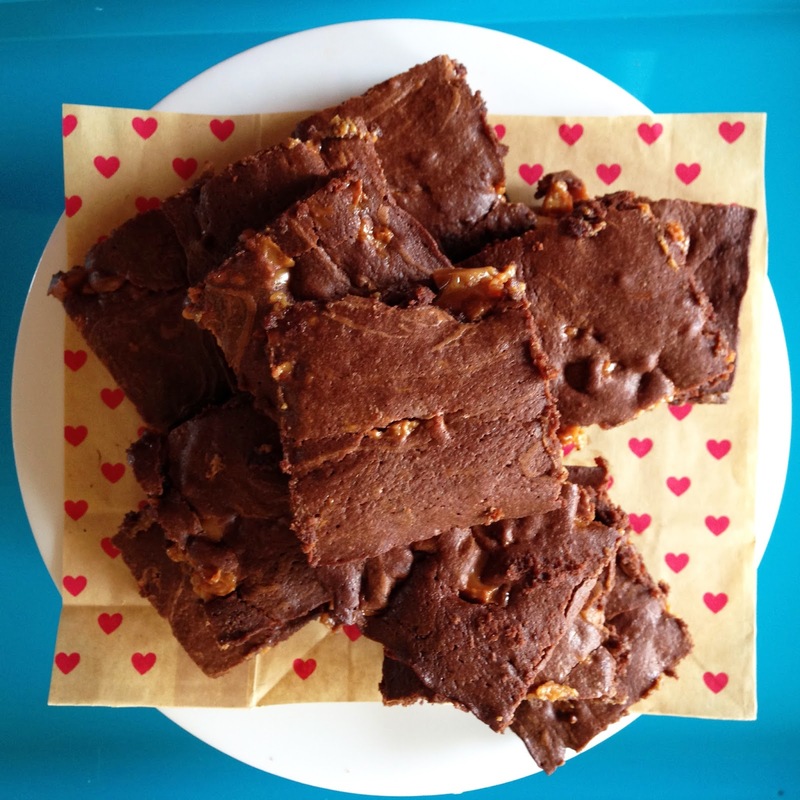 Who can say no to a baked good that has been made especially for them? Someone without a soul, that's who, and then they don't deserve them! I have had a fondness for dulce de leche / cooked sweetened condensed milk since my childhood when all Christmas's and family occasions included delicious caramel tarts made from a a sweet biscuit heated into a tart shape and then the caramel spooned in and occasionally cream on top. DELICIOUS! 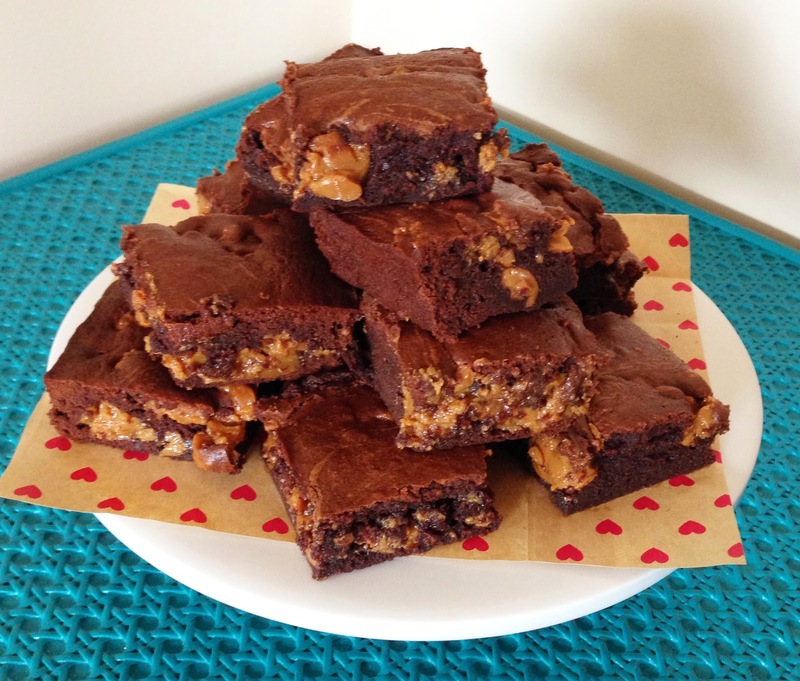 So I am all for using this same caramel in other recipes. 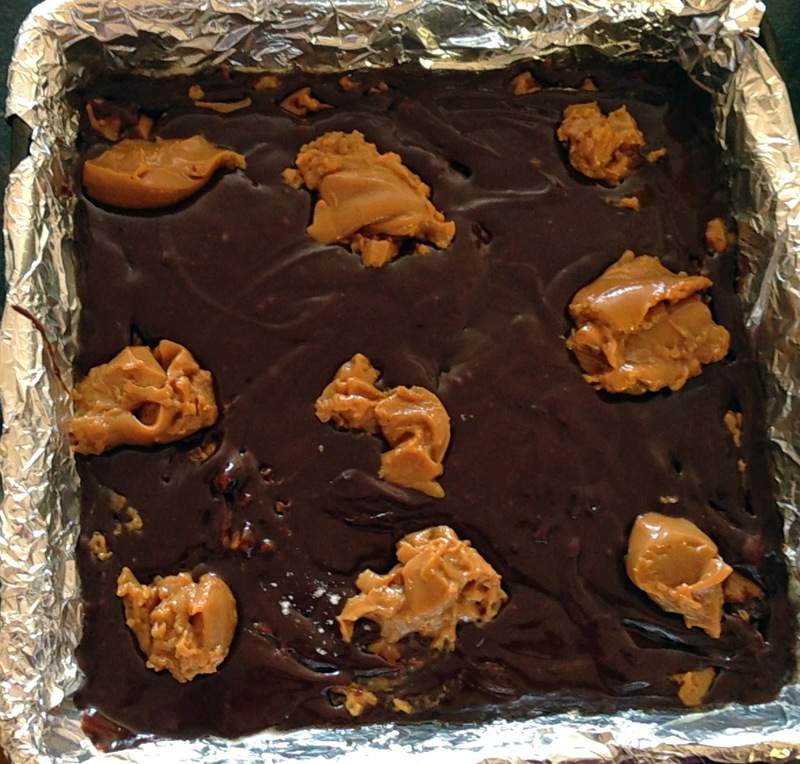 You can of course use caramel in a tin for this recipe, but I really prefer cooking my own. 1. 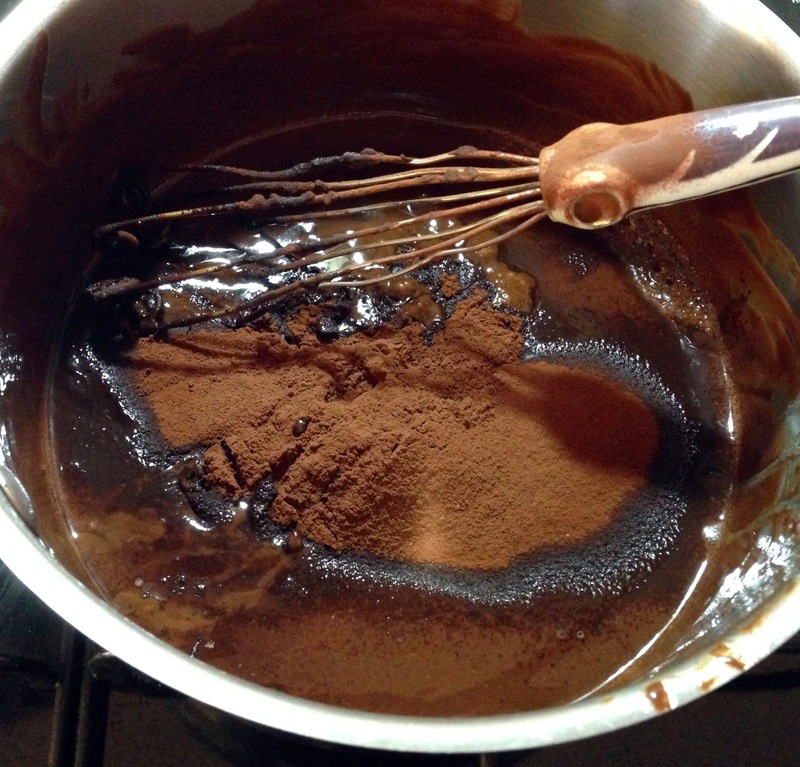 Day before or at least 3 hrs before cooking brownies, prepare dulce de leche. Place unopened can in a saucepan full of hot water, bring to boil with lid on, then reduce to a simmer and simmer for 2.5 hours. VERRRYYYY IMPORTANT. Do not let water evaporate from saucepan. You will need to check on water level every 1/2 hr or so and refill if needed. If the saucepan boils dry, the can can be at risk of exploding. When 2.5 hours is up, run cold water over can for a minute, take can out of saucepan, place on a plate and then put in the fridge. If you open the can whilst it is still warm, the caramel may spurt out and burn you. If this is all too much work, skip this step and buy a can of caramel top and fill instead! 2.Preheat oven to 175 degrees. 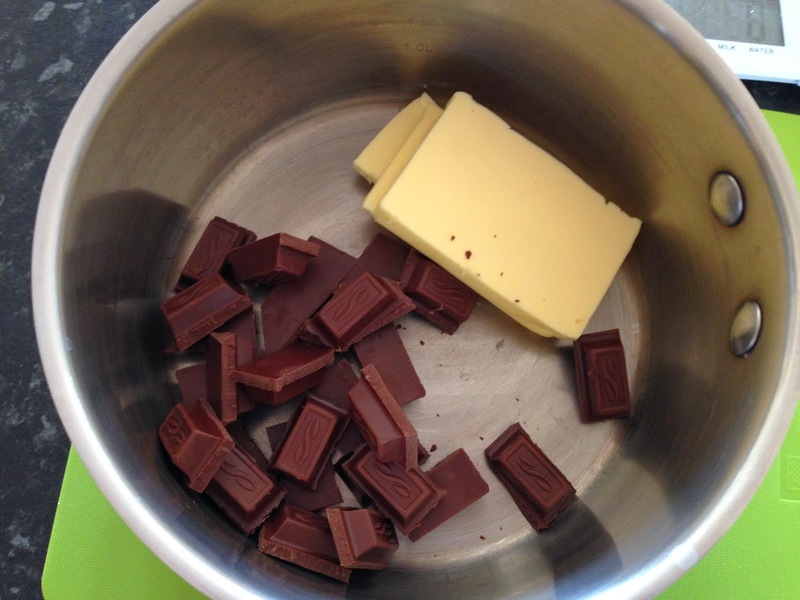 Place butter and chocolate in a saucepan and melt, stirring the whole time, over a low heat. Yep, forgot vanilla, but I liked it without. Feel free to add! 3. Turn off heat and sift in cocoa. Stir until there are no lumps. Add in eggs one at a time, stirring after each addition. 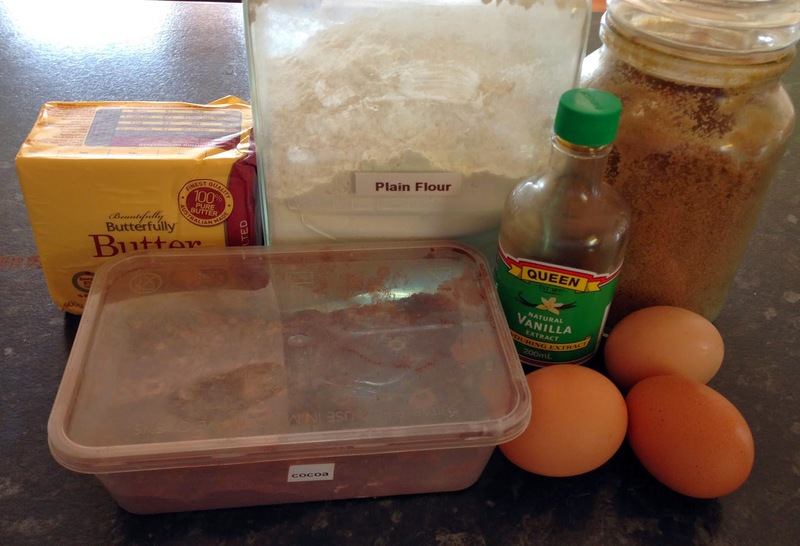 4.Stir in sugar until combined, then flour. 5. 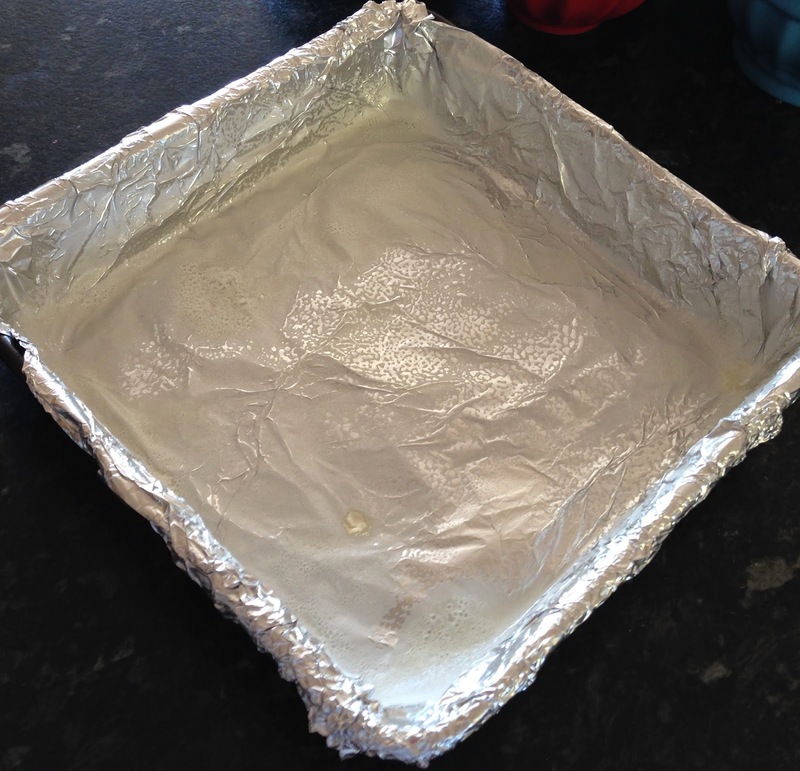 Line a 20cm x 20cm square pan with foil and rub with butter or spray with oil, whichever floats your boat. 6. Place half of batter in bottom of pan. Plop spoonfulls of caramel randomly on batter and then run a knife through to break up the caramel a little. 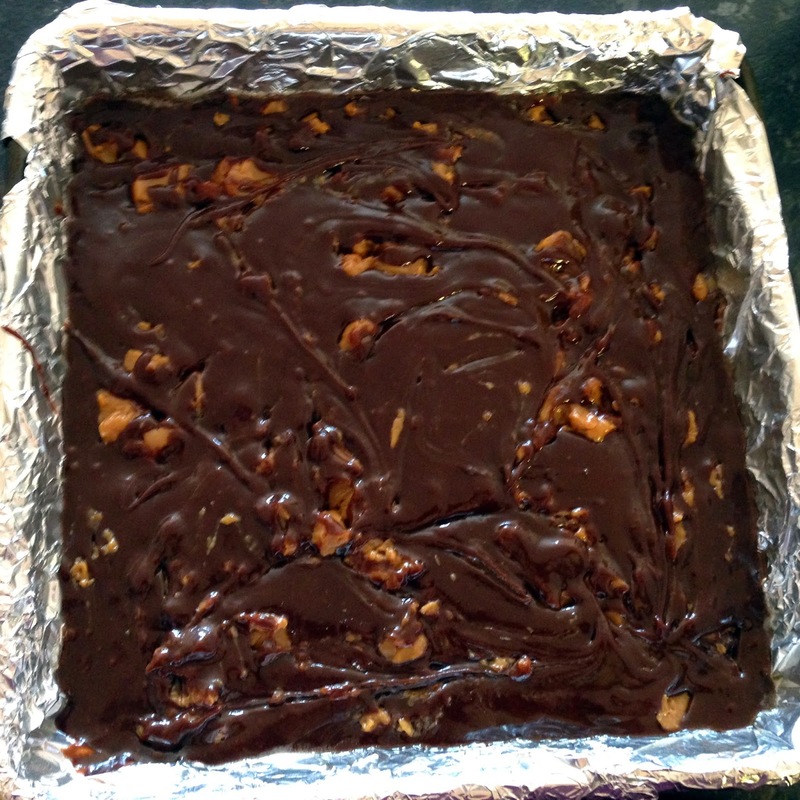 Place second half of batter on top and repeat with caramel and swirls. 7. Place in oven for around 30 minutes. 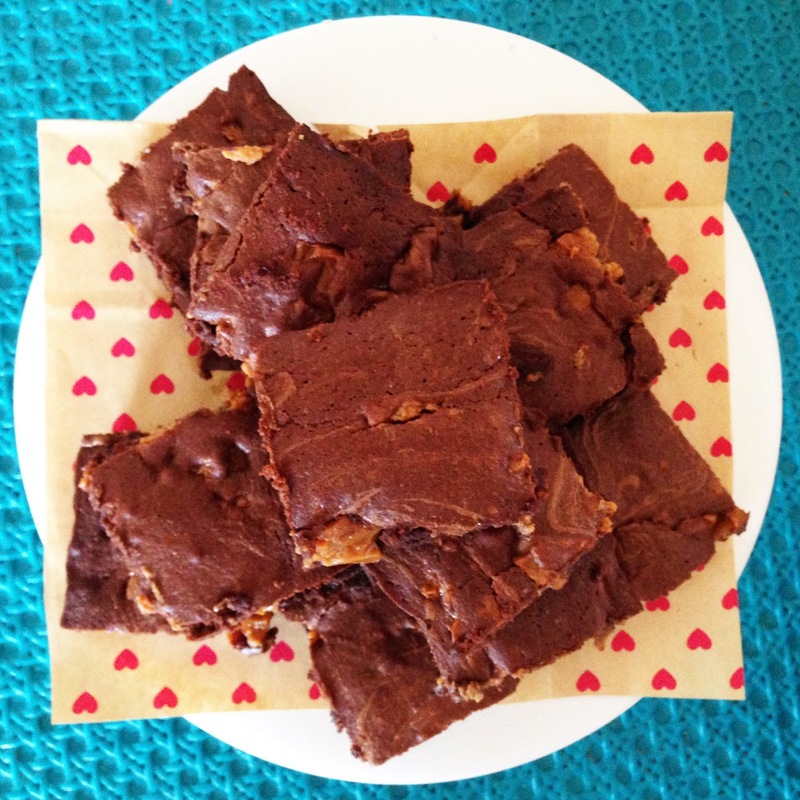 Check after around 20 minutes as you want a bit of moistness in the middle.Makes for a delightfully chewy brownie once it has cooled down. 8. Cut and deliver to neighbours (what will fit into your chosen container of course, you don't want to overwhelm them with your kindness).